I want to learn to SCUBA DIVE! 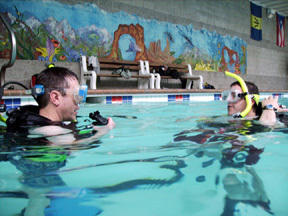 Practice the skills you learned during self-study during confined-water dives. 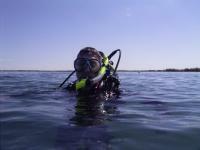 Experience the open water environment–SCUBA dive! Here is where you have the opportunity to practice skills under controlled conditions in an open water environment. 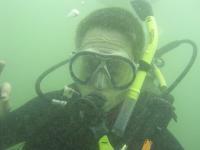 4 Open Water SCUBA dives over 2 days. A rough estimate for the course is about 40 hours–split between self study, knowledge review sessions, confined water dives and open water dives. The course is performance based, so the actual number of hours can vary. After completing the course and the 4 open water dives, you will be certified as a PADI Open Water Diver. After that, you and your buddy can dive in similar or better conditions, rent and buy scuba equipment and start your lifetime of adventure! An introduction to marine ecology & coral reefs. Want to get started RIGHT NOW? Try PADI eLearning. With PADI eLearning, you can start in on the course material immediately. You can complete all of the knowledge development online and then bring your eLearning student Record to me to complete your training. When you signup for PADI eLearning, you’ll be asked to associate with a PADI Dive Center. Please select Dive Utah-Holladay. Contact me for any questions about eLearning. Get started TODAY with PADI eLearning. Alright, but I have more questions. Contact me with any questions and to sign up for the PADI Open Water Diver Course. Details, Details, Details: What are you going to learn? Some mask skills. Sometimes your mask fogs, so you need to defog it underwater. Maybe you need to adjust the mask strap, or maybe your buddy just made you laugh so hard that your mask filled with a bit of water. No reason to abort the dive since you’ll know how to remove that water. Regulator skills. Sometimes you might want to take your regulator out of your mouth, maybe for a photo or just to adjust the hose. No worries…it’s easy. The best skill in diving: hovering! This is where you practice becoming weightless and hover mid-water, using only your lungs to adjust your position in the water. We’ll practice several buoyancy control techniques leading up to hovering. Emergency procedures: how to handle the what-if’s. What if you run low on air? What if you lose your buddy? And a few others. 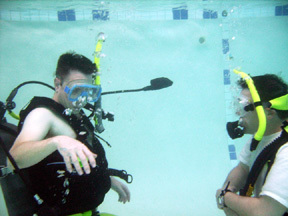 In class you’ll learn about the dive environment, how to select dive equipment that’s right for you and how to plan dives to have an awesome time and prevent problems. A lot goes into the PADI Open Water Diver course, but it’s well worth it. As an Open Water Diver you’ve earned a license to explore, opening up a lifetime of Adventure. Contact me to get started today with your PADI Open Water Diver course. This entry was posted in Start Here: Open Water Diver. Bookmark the permalink.